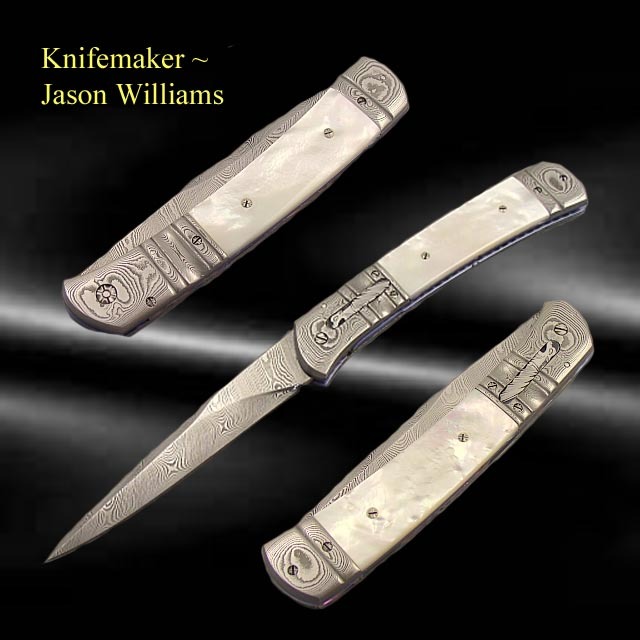 Bill McHenry, the legendary knife maker and teacher of over 10 top makers, taught Jason, his stepson, and trained him well he did. Some think that Jason actually has exceeded McHenry in his artistic designs. Here we have a 9 7/8 inch Auto of impressive workmanship and design. Look at the silhouette of this knife. Such balance of line. Celtic Dragon bar release. Filed back bar with a carved Celtic figure and inlayed black lip Mother of Pearl inserts. His front pivot screw is engraved with a JW, as McHenry does his with a WM. Classy piece here.